The likely first stop on your trip to Southern Thailand will be the capital city of Bangkok. You could bypass it and catch an internal flight to the South, but after a 12 hour flight you might need some rest-bite. For the second year in a row, this massive maze of skyscrapers was named the world’s top tourism destination in 2017 with more than 20 million international visitors! 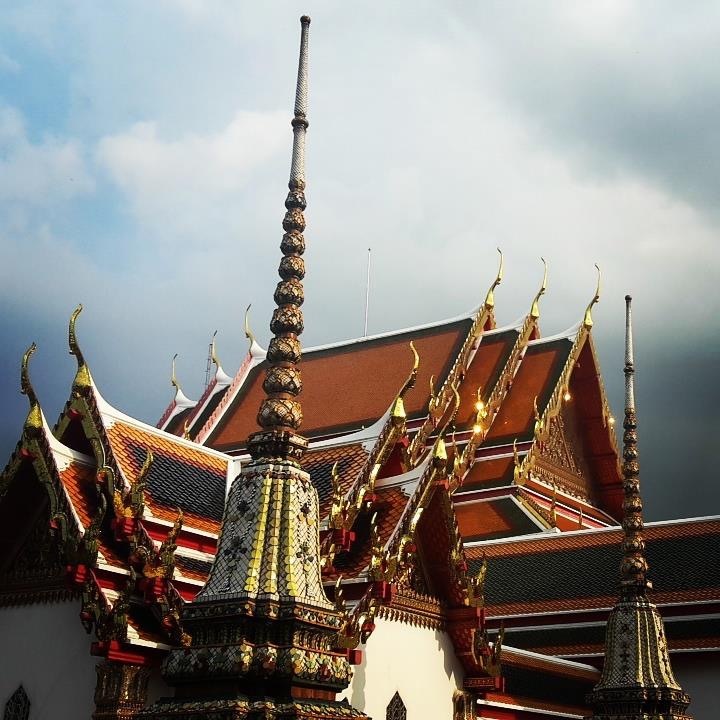 For a detailed itinerary of what to do in Bangkok, click here. Krabi is the most visited province in Thailand. Its coastal towns are popular destinations for tourists from all over the world, and the gateway to the country’s breathtaking tropical islands. You have two options of getting from the capital city to the South; flight or train. I’ve taken both and flying was by far the most comfortable but you lose most of the day getting from A to B. The flight itself was just over an hour, but as with most airports, you have to arrive 2 hours before take-off. It cost £22 for the internal ticket to Krabi, and we had to pay £5 for extra baggage allowance for our backpacks. The overnight train saves you a nights accommodation and a whole day which is great, but unlike the service to Chiang Mai, I found it impossible to sleep. The air-con was broken so all windows were wide open, allowing the rancid stench of sewage from the track to flood the carriage. Bugs were also crawling over the bed. That might not be the case with all trains of course, and this was in 2015, so I’d read up on more recent reviews to get a better picture. Once off the plane, jump in a taxi or better yet arrange a pick-up with your hotel/hostel to get to Krabi Town. 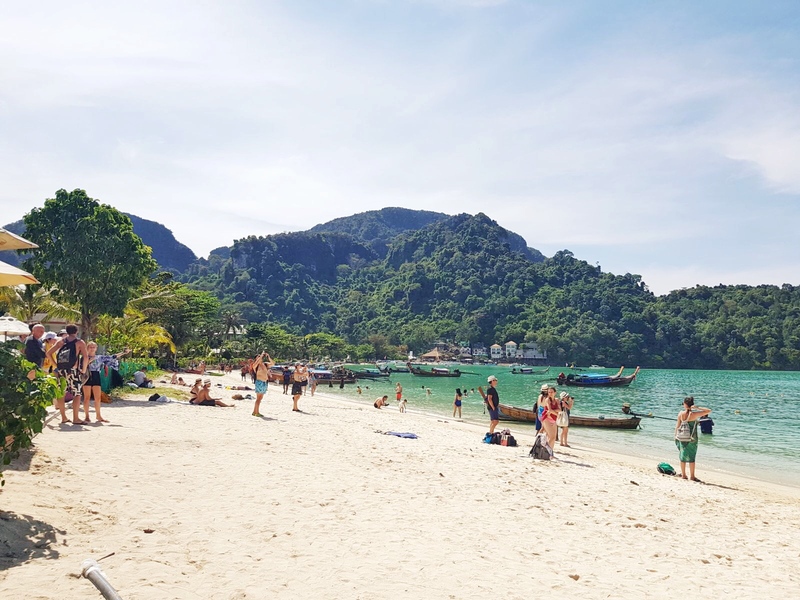 We stayed about a 20 minute drive from the centre in an area called Ao Nang, a popular place for its picturesque but busy beach. It’s a coastal resort, so don’t expect much authenticity when it comes to places to eat and drink, and it’s quite pricey. You can hire a moped for 200 baht (£4.50) a day and explore the nearby Tiger Cave Temple (about 7km outside Krabi Town). The cave’s main tourist attraction is the 1,272-step climb up a limestone tower to see the ‘footprint of the Buddha’, so wear comfortable shoes!  On your way you’ll drive down ‘Romantic Road’ which is brilliant on a bike. 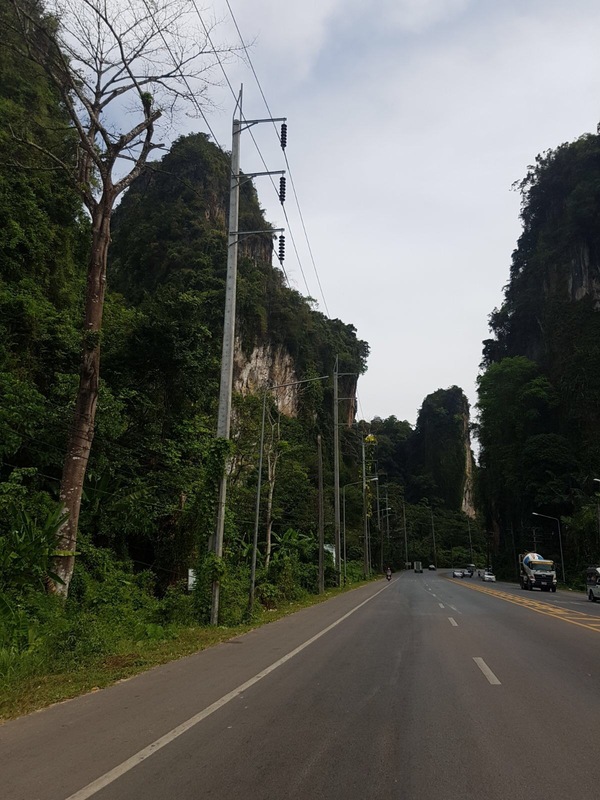 Head towards Krabi Town if you want to explore more of the area. A great coffee shop there is called Sprucy Cafe and Bakery and restaurant is Chalita. We were also encouraged to take the mopeds to a nearby island called Koh Klang, which is a short boat ride away from the pier. We didn’t have time but I’ve read it’s a nice day out and a great opportunity to get off the mainland. For a longer trip (about 70km each way) you could go to the Hot Springs and Emerald Pool. In Ao Nang there are a few very reasonably priced and delicious restaurants, but because they are few and fair between they get busy quick! Our favourite was called Jungle Kitchen, which is run by a local family (number 1 on Trip Advisor for the area). We had to book two days in advance, so if you want to eat there go on your first night and reserve a table for your last. Try the Coconut Lassie and Massaman Curry  A good bar to have a few cocktails and listen to live music is just across the road called Relax. 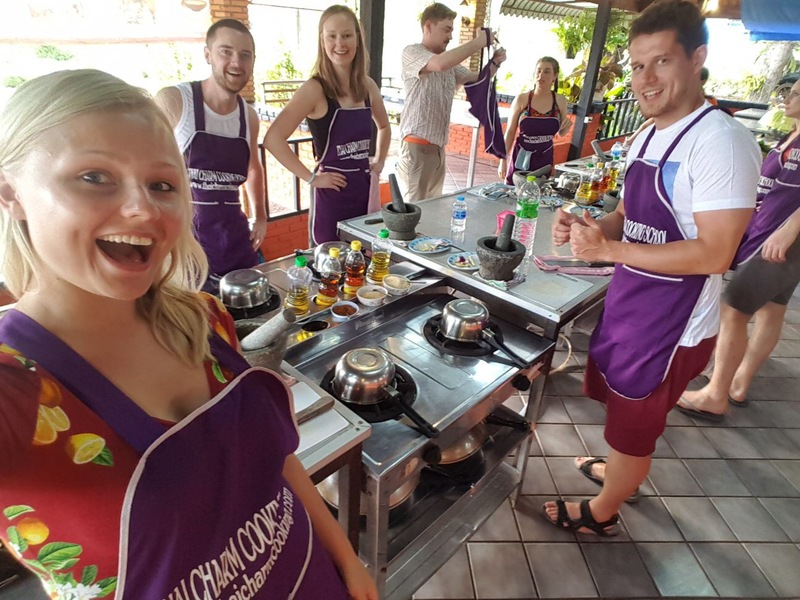 Our favourite thing we did in Krabi was the Thai Charm Cooking class. 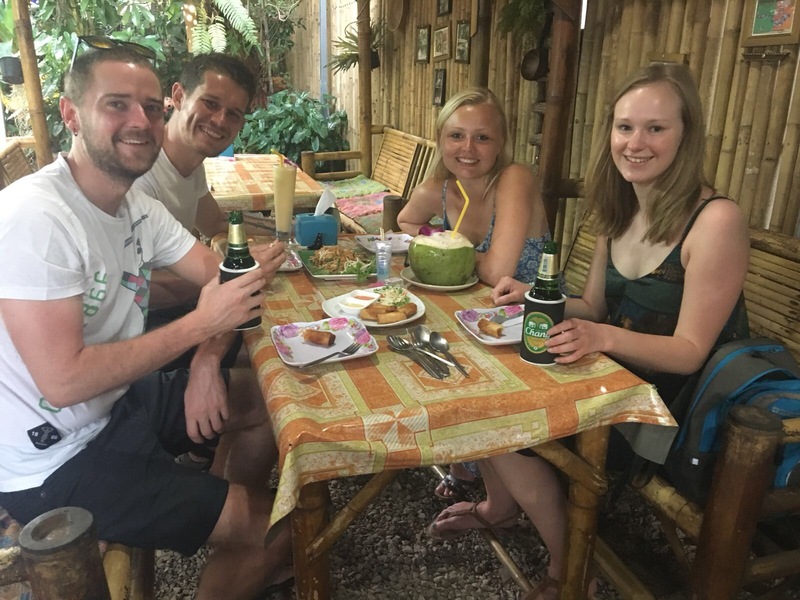 Situated just outside of the main town, the school offers morning, afternoon and evening lessons in authentic Thai cuisine. We were taught how to make five courses, including a soup, salad, appetizer, curry (including the paste), and dessert! I’d recommend the evening class and skipping lunch if you can because they are VERY generous with portion sizes. The 4 hour class cost 1,200 baht pp (£27). 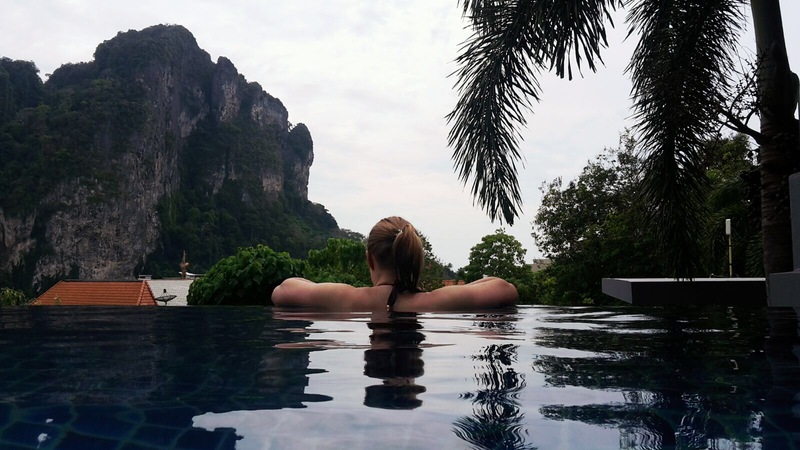 Other things to do in Krabi is have a £6 Thai massage at one of the many parlours in the area, laze around on the beach and sip on a few cocktails, and zip-lining and rock climbing at Railay Beach. 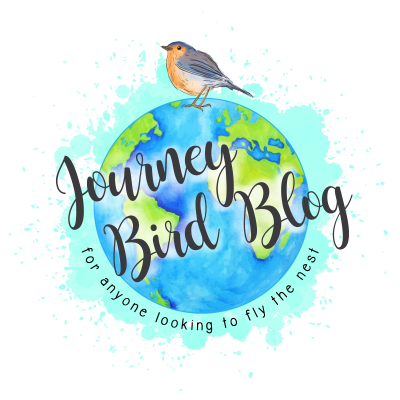 It’s up to you which way round you’d like to do the Southern Thailand islands, but I’ve decided to start with Koh Pha Ngan and finish with Phi Phi as it’s closer to Krabi Airport for your connecting flight back to Bangkok or bus journey to Malaysia. 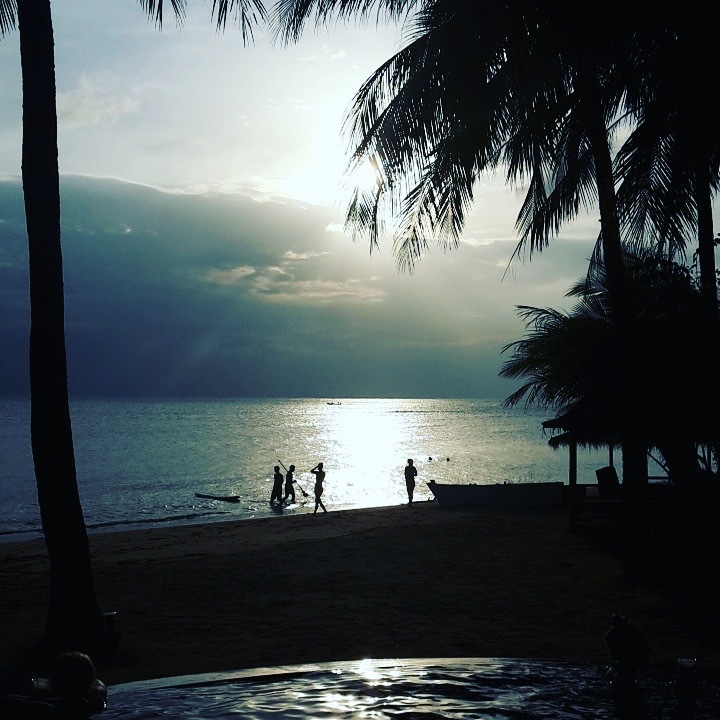 Known for its noisy Full Moon Party which takes place every month in Haad Rin, Koh Pha Ngan is also famous for its plentiful coconut trees and white sand beaches. I’d recommend not going during the FM Party as it gets incredibly busy, and beach parties still take place every week (just less crowded). There are daily Bus & High-Speed Ferry transfers from Krabi to Koh Phangan, Koh Tao & Koh Samui. I’ve only had the pleasure of seeing Koh-Phangan but you can always island hop if you have the time. A one-way ticket should cost around £20pp and take 5-6 hours. You can book online a few days in advance at 12Go Asia. When you get off the ferry at Thong Sala port you can grab a songthaew shared taxi or private car to your accommodation. Remember to haggle if the prices seem too high for the distance. We stayed at Sarana Bungalows, which is right by a quiet stretch of beach and has a beautiful infinity pool. It should cost between £10-£20pp depending on what room you take and the time of year. They also have a yoga hall if you want to stretch out after a night of dancing. You will need to get a taxi to the main party strip but it won’t cost much. Day one hire a moped or book an excursion to see the many beaches on the island. My favourite was the dreamy Haad Son (aka ‘Secret Beach’.) Day two can be for waterfall hunting. 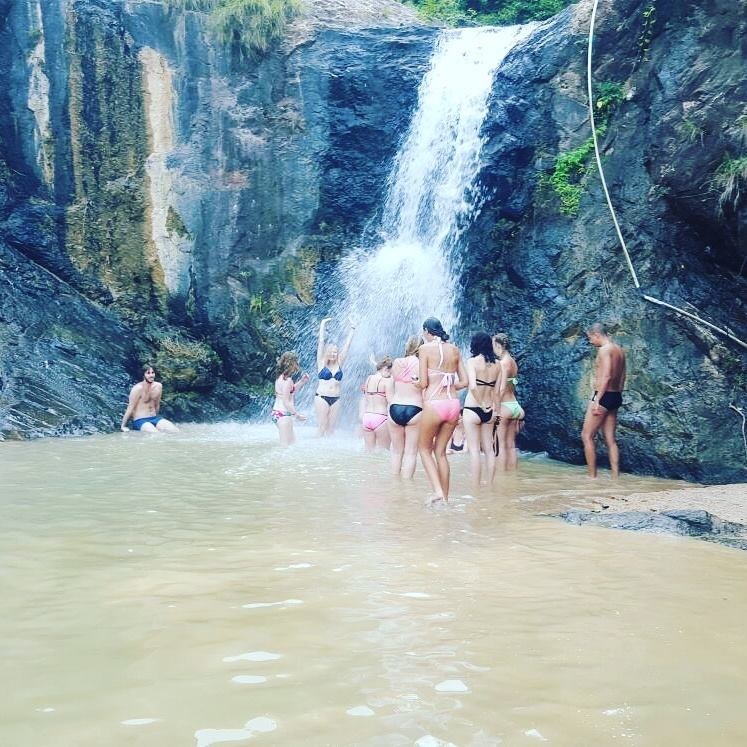 The most popular are Phaeng Waterfall, Wang Sai, and Paradise. 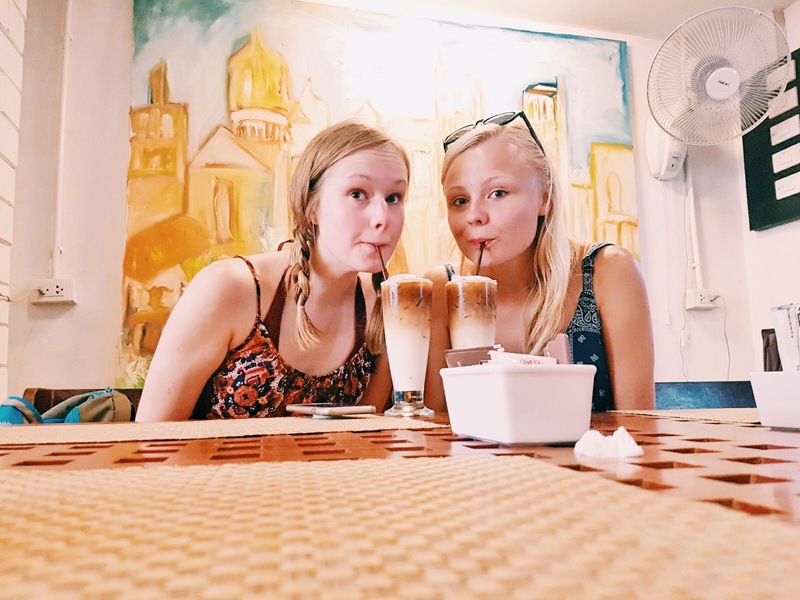 Other things to do is Thong Sala night market, and visit the Herbal Sauna Baan Tai (founded by monks from Wat Pho temple and right near a bloody old and massive tree ). Tip: Try to get there after 6 p.m. it is too hot to enjoy the sauna in the middle of the day and it’s only open from 2pm to 7pm. In the evening it’s time to eat. A great little taste of home is The Mason’s Arms, which is a complete replica of an English pub with things like pies, sausage and mash, and fish and chips on the menu! Other great spots to check out is Rasta Baby (like dinner in a treehouse), The Flying Dutchman (fall asleep in a hammock by the beach), and Cafe 2401 and Guesthouse (great for sunset watching). For an alcohol bevy try Loi Lay Floating Bar, and Ku Club. Avoid the temptation to drink Sang Som. This alcoholic drink is VERY addicting and can cause you to forget things, putting yourself at risk. I only drank bottled drinks there just to be safe when out with a big group of girls. Tip: You might be tempted to do drugs on the island as many people do out in the open, but remember there are undercover police looking for foreigners doing just that. A fine for cannabis is around £1,439 ($2,000) and class A’s is even higher. No money? Then look forward to time in Thai prison. 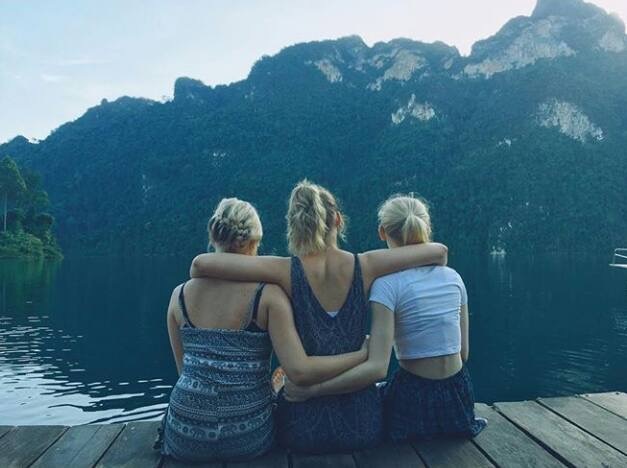 If you have time you MUST travel to Khao Sok National Park to really appreciate Thailand’s dramatic landscape. Large rocks cascade out of the water and floating huts on rivers are discretely nestled within the forests. It costs around £12 for a 5 hour bus ride from Koh Pha Ngan. If you’re staying on the river itself, it’s a short boat ride from there. Spend your days kayaking, swimming, and cave exploring. Then it’s time to head back to Krabi Town. You’ll have to book a boat from Krabi Town to the main Phi Phi Island at least two days in advance as it fills up quick (learnt this the hard way ). 12Go Asia is a good website for booking transport all over the continent and all you’ll need to do is print off the ticket which should cost around £12pp for a return to Krabi Pier. The journey is about 1.5/2 hours long but it’s nice and smooth and has great views. There are no cars on Phi Phi, so the only way to get to your accommodation is by foot or boat taxi. Everything is walking distance but in the scorching heat you might want to opt for the taxi if it’s further out of town like ours. You can arrange a pick up from the dock with some hotels in advance. 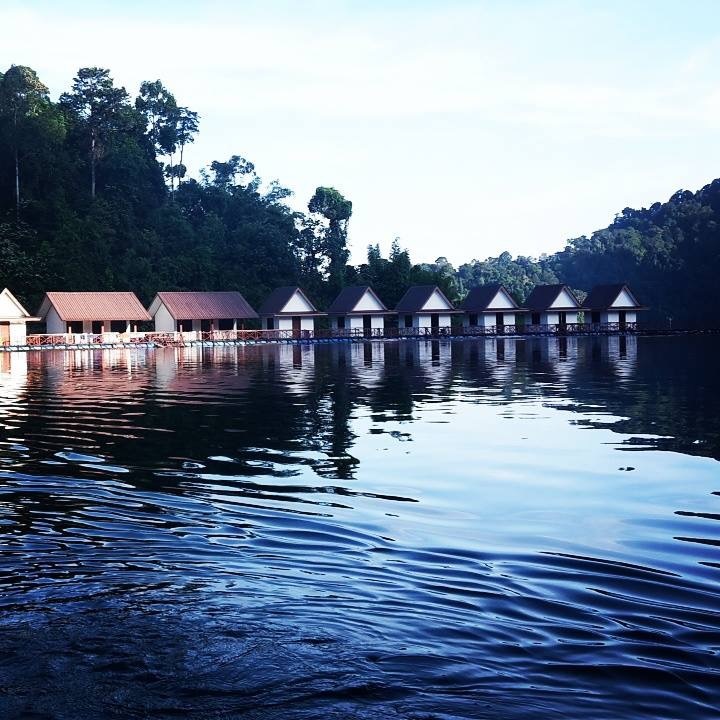 We stayed at Bay View Resort, which has villas overlooking the bay. Unfortunately their website was slightly misleading as we thought we would get a sea view but instead were put at the back with a lovely white wall to look at. I’d suggest paying a bit more for a nicer room if you can afford it, but the rooms were all modern and clean. They also have a pool, breakfast buffet, and secluded beach which not many people go to as they’d have to trek through the resort to reach it. If you don’t stay there, still walk 30 minutes to Long Beach from the town as it’s worth it! For a cheaper alternative with a more lively scene, try Blanco Dorm and Beach Bar. 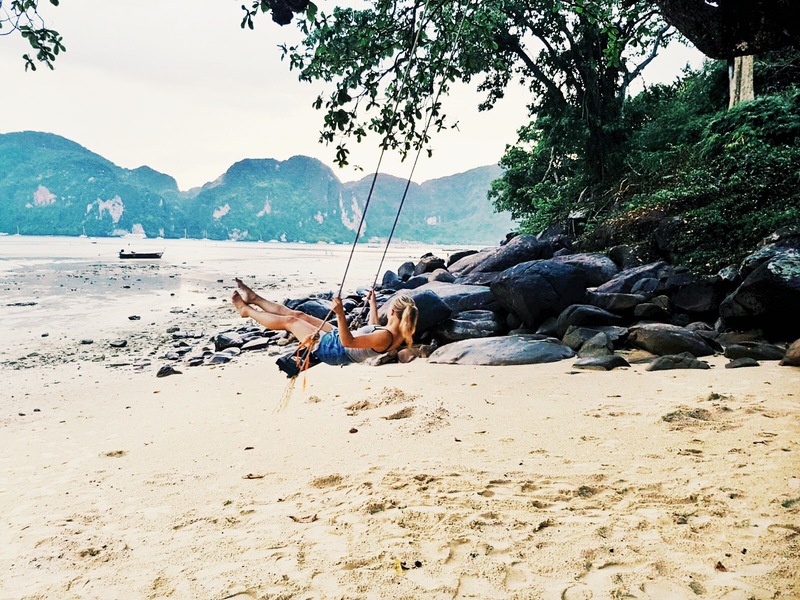 Your first morning is for lounging on a beach, sipping a coconut or cocktail (it’s 5pm somewhere ) and finally using that snorkelling set! Once the sun gets too much head into Town and mooch around the many souvenir stalls and shops. A nice place to stop for lunch in town is Patcheree Bakery House which serves the BEST cold latte I’ve ever had…still dreaming about it now. They also offer reasonably priced local dishes including curries, Pad Thai and fried rice. On day two book an afternoon/evening boat tour to the iconic and slightly overrated Maya Bay. I say overrated because unfortunately it has become overrun with tourists and boats during the day after featuring in the Danny Doyle film The Beach, starring Leonardo Di Caprio (he’s not included in the tour ). I still think it’s worth stopping by though to get a sense of the devastating impact of the 2004 Boxing Day tsunami, which nearly wiped out the island. Also, despite its popularity the bay is still beautiful. Tip: Bear in mind it will close to the public in June until September 2018, as authorities try to reverse decades of damage to the marine environment. Most tours start at 2/3pm and go on until around 7/8pm. You’ll first journey to the Viking Caves to find out about the hunting/harvesting of swiftlet birds’ nests, or as I like to call them Spit Swiflets. They use their saliva to create shelter, which are then harvested to be eaten 濫. The Chinese believe it promotes good health and skin but I wasn’t keen on trying a sample. 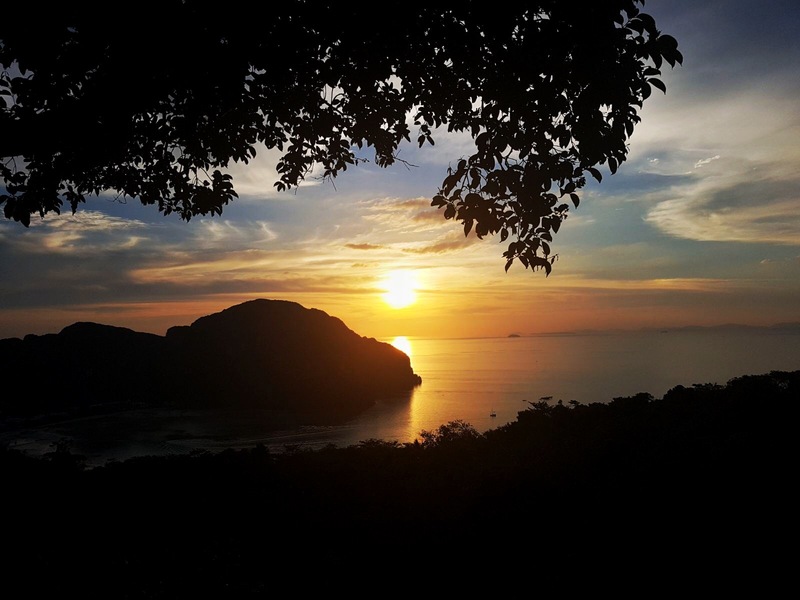 After that, you stop off at Pileh Bay for swimming, snorkeling and kayaking before arriving at Maya Bay, where you will have free time to explore the island. The bay is a National Park with a 400 baht entrance fee, so make sure your tour includes this in their price. 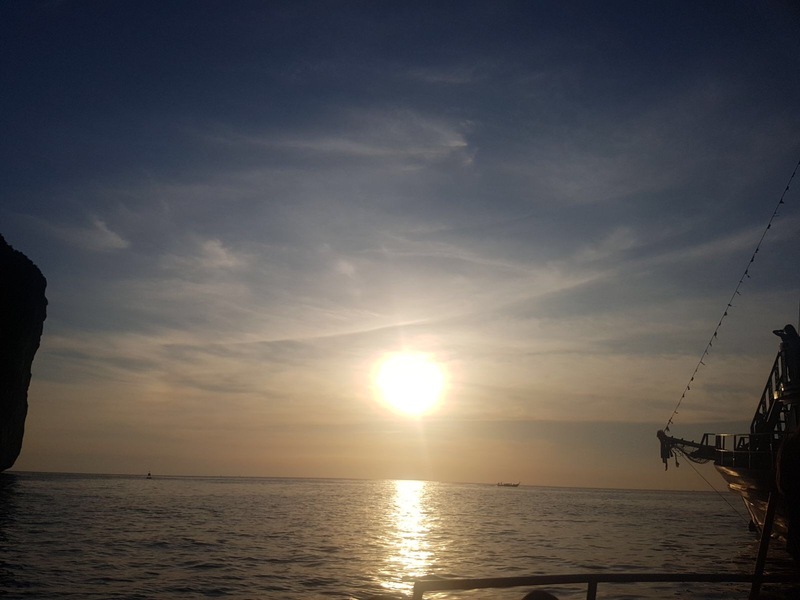 Finally, it’s a tasty Thai dinner on the boat and watching the breathtaking sunset disappear from the horizon. I’ve done two sunset cruises with separate companies and they were both great. 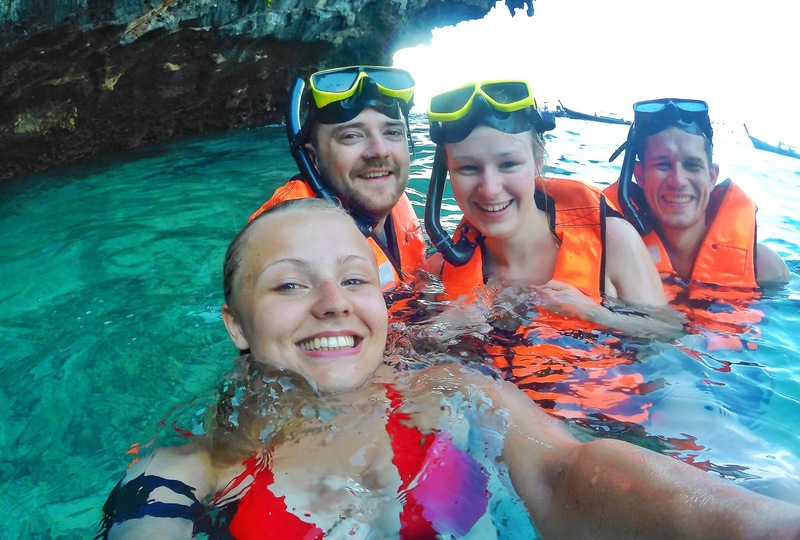 Maya Bay Tours is the most popular on the island and doesn’t run everyday so it’s worth booking with them a few days in advance. It includes the bio-luminescent plankton swimming (like in that cheesy scene from The Beach). It costs around 2,000 baht (£46pp). Pirate Boat Tours is a good and cheaper alternative. It doesn’t include the plankton, but stops off at a beach inhabited by cheeky monkeys. It cost us 1,200 baht (£27pp). You can also hire a speedboat or an authentic longtail boat but remember they don’t have toilets or much room! 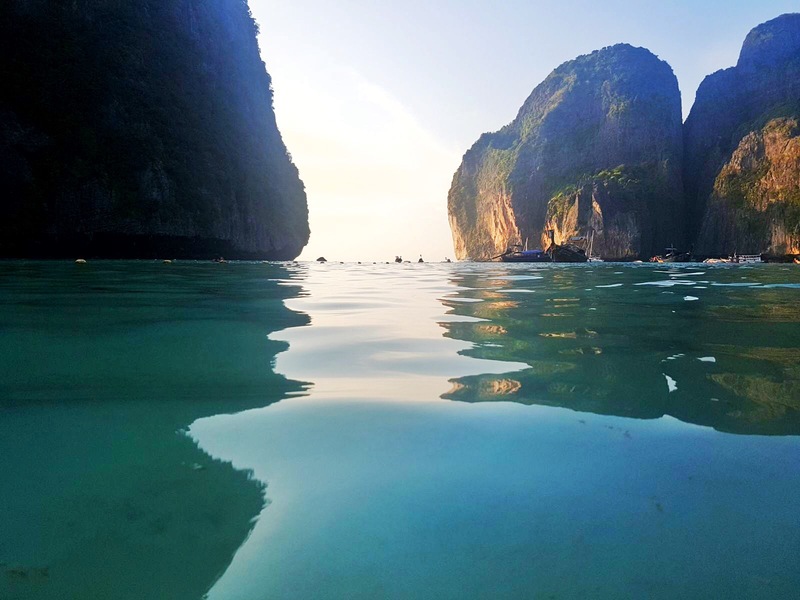 Other things to do on Phi Phi is kayak to the more secluded beaches around the island, scuba-diving, journey to Bamboo Island, and hike to the incredible viewpoints. There are three, and 3 is by far the best as it’s the highest point, but I’d suggest leaving 40 minutes before sunset when it’s not too hot and bringing plenty of bug spray. Less active travellers should seek out numero uno. Finally it’s heading home, so back to mainland Krabi and catching a flight to Bangkok! I’d argue Thai food is the best in the whole of Asia, so stick to local dishes as much as possible. Panang Curry, Green and Yellow Curry, Massaman Curry, Pad Thai are a must. If in the North try Khao Soi! Haggling is a must at Thailand markets. Vendors will always put the price higher than the item is worth so get used to bargaining. Chang beer is the cheap local drink and can be bought for a little as 25p in places. 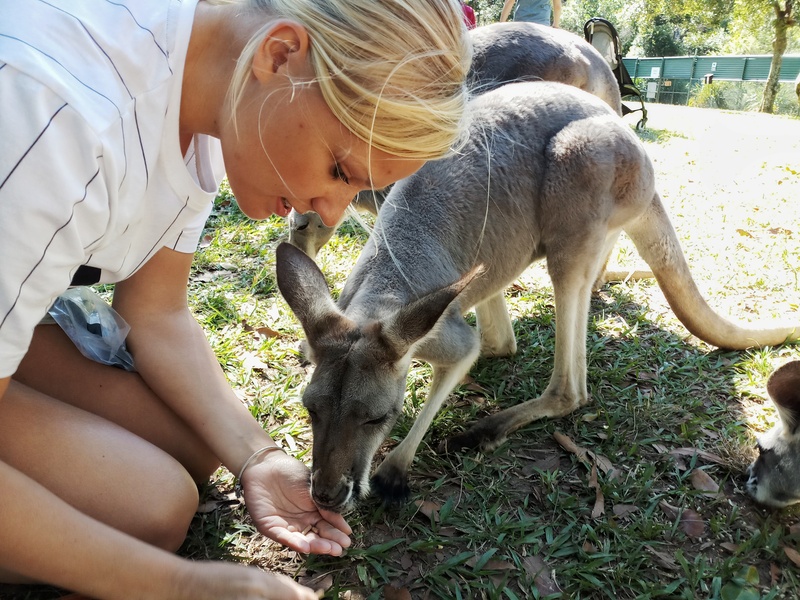 Don’t book excursions until you arrive! Online will be more expensive and you can haggle the price in person. There are always places the day before, even for the most popular tours.